With all the new research on the benefits of standing rather than sitting behind a computer for hours at a time, they're starting to create new work stations. I need one of those. I’ve been working with my building manager for the past couple of weeks to come up with a sit-stand solution for my workspace. Right now I’m sitting 9 hours per day at work plus whatever time I spend on the PC at home. I’m comitted to the concept of being able to stand but have $0 budgeted by my employer for more ergonomically-friendly options. The solution we came up with is for me to pay for a $40 IKEA desk out-of-pocket which I’m going to modify to sit on top of my existing desk so I can work standing for at least half of my day. My employer is going to give me a second monitor so I can toggle back and forth as I transition. Hope to have in place in a week or two and after 10 years of sitting at work, I am excited. My brother built his own standing desk decades ago. Don’t forget a good gel pad to stand on because standing for hours has its own issues. Don’t forget a good gel pad to stand on because standing for hours has its own issues. That is true. The most work-related pain I have ever experienced was a catalog warehouse job where I stood for 8 hours packing orders. I never had to lift more than ten pounds but had constant back pain. I switched for a job with heavy lifting, but walking, and felt much better. I had my desk raised to standing a month or more ago and I really like it. The first few days my back ached but it’s all better now. I have a tall stool that I bought at IKEA and I sit on that when I want to do serious writing. I do my puttering and emailing standing. I think it’s given me more enegry and it’s also easier to get up and go see people because less inertia. 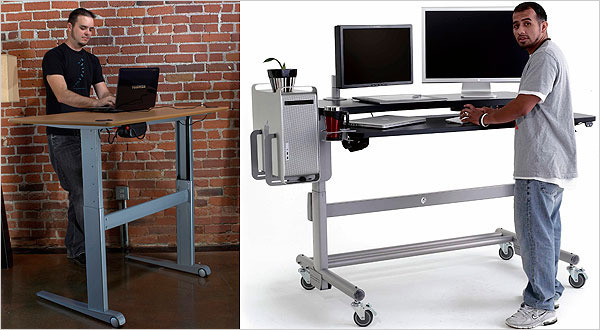 A standing desk can be a good idea for those who are consistently using the desk for short periods of time. We have a standing desk at my office and it is very convenient for walking up and then walking a away shortly. We also purchased a tall stool that can be used if you’re going to be using the desk for an extended period of time. The desk has worked well so far… I’ll keep you posted if we come across any noticeable problems.